An option gives the owner the right, but not the obligation, to buy or sell the underlying instrument(we assume stocks here) at a specified price(strike price) on or before a specified date(exercise date) in the future. (this is different for European options as they can only be exercised at the end date). Exercising the option is using that right to to buy or sell the underlying instrument. In simpler terms, an option allows you to pay a certain amount of money (the option price) to allow you to buy or sell a stock at the price (strike price) you decided on when buying the option. A call gives you the ability to buy at a specified price, whereas a put gives you the ability to sell at a specified price. Let’s say we wish to exercise 20 AAPL October 20th call options which have a strike price of $100. We would let our broker know and he would then “use up” your option contract (hence it no longer has any value) and buy 20 * 100 (each option contract is for 100 shares) 2000 shares of AAPL at a price of $100. This also means you have to have the money to be able to buy 2000 shares at $100 = $200,000. If AAPL is at $105 you would then earn $10,000 profit on this trade. Brokers will often times allow you to simply take the profit as well just like you would at expiry by immediately selling the shares. Hence in the example above you would just obtain $10,000 instead of needing the $200,000 cash to have to purchase the stocks in the interim. At it’s core options simply track the underlying asset’s price and so why would we buy an option instead of the underlying asset? There are two major reasons; leverage and strategies. Option’s provide you with being able to greatly leverage your positions since each option contract is for 100 shares. This means you can greatly increase how much you make (lose) with the amount of money you have. 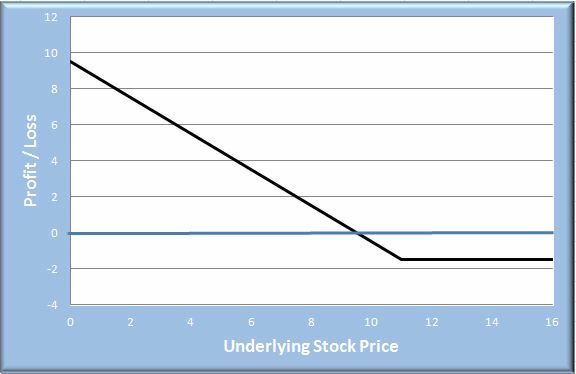 If we look at a very simple example we can see how we can greatly increase our profit/loss with options. With the same amount of money I can buy 1 share of AAPL at $100. Now let’s say the price of AAPL rises to $101 and we sell our positions. If we just owned the stock we would sell it for $101 and make $1. The reverse is true for the losses. Although in reality the differences are not quite as marked options provide a way to very easily leverage your positions and gain much more exposure than you would be able to just buying stocks. Note: this is a very simplified example to explain the concepts. There is an infinite number of strategies that can be used with the aid of options that cannot be done with simply owning or shorting the stock. These strategies allow you select any number of pros and cons depending on your strategy. For example, if you think the price of the stock is not likely to move, with options you can tailor a strategy that can still give you profit if, for example the price does not move more than $1 for a month. 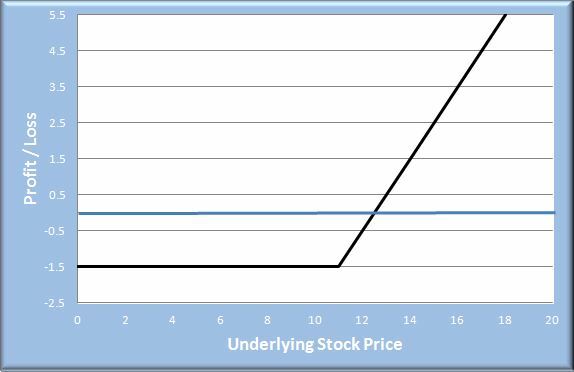 Option pricing is typically done using the black-scholes model which can be quite complex. The main thing to understand is that american-style options have intrinsic value because of the fact that they expire in the future. The option’s price will therefore reflect the immediate profit you could make (if any) by exercising this option and the time value. For example, an out-of-the money (you would not exercise this option because you would lose more money) put would still have a price above 0 as long as it is not expired because there is always a chance that the option may become in-the-money (by exercising this option you would gain money, note:this does not mean, however, that you are making a profit. You can be in the money but still losing money because the option price is greater than the profit you make from exercising the option). Option Payoff Charts and tables are very useful for visualizing and understanding how options work. In these scenarios you have already purchased or “written”(writing an option means you have sold the option to someone who has bought it) the option. The stock price is a “what if the stock price goes to that price”. hence the most you can lose is the price you paid. Example 2: Writing a Call Option with a $9 Strike Price and an option price of $1.5 for 1 share in the contract (normally this is 100 shares per contract) and a current price of $10. hence you make the option price. As we can see above, when buying a call our loss is limited to the option’s price but when we write an option our losses are potentially infinite. 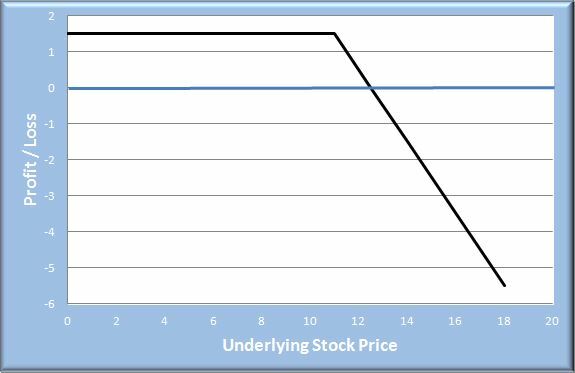 With contracts of 100 shares each you can see how quickly you can lose very large sums by writing options. 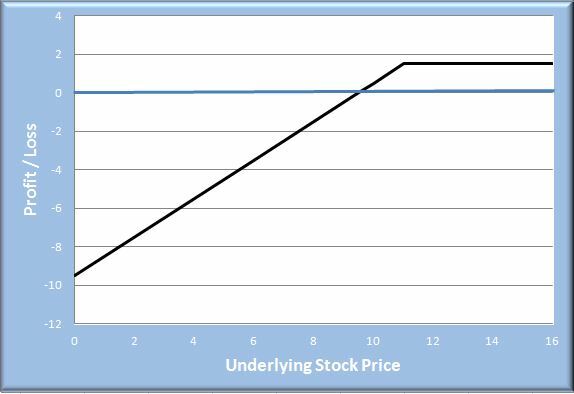 Example 3: Bought put Option with a $11 Strike Price and an option price of $1.5 for 1 share in the contract (normally this is 100 shares per contract) and a current price of $10. 10 1 -0.5 The option is in the money but you still have a loss. 8.5 -2.5 -1.0 The option is in the money still. 10.5 0 1 Here the option is still in the money but are making a profit. 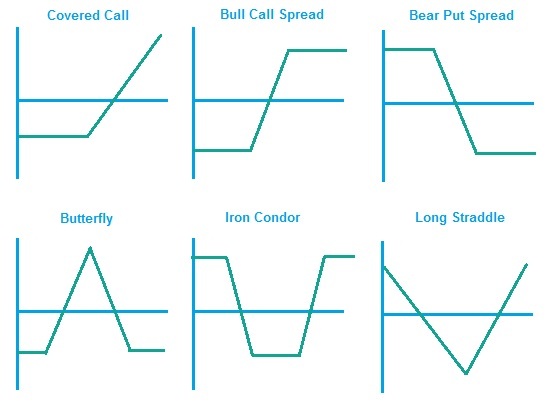 Below we can see just a few common strategies that can be accomplished by using a different combination of owning and shorting (selling) the option or stock, using a call or a put and varying the stock price. You can also create even more in depth strategies by varying the expiration dates of your options. If options trading is allowed in your contest, you can use the Options trading page. Trading options on your simulator is easy but there a few differences between the real world and a simulator. To trade options start by going to the Make a trade => trade options tab. 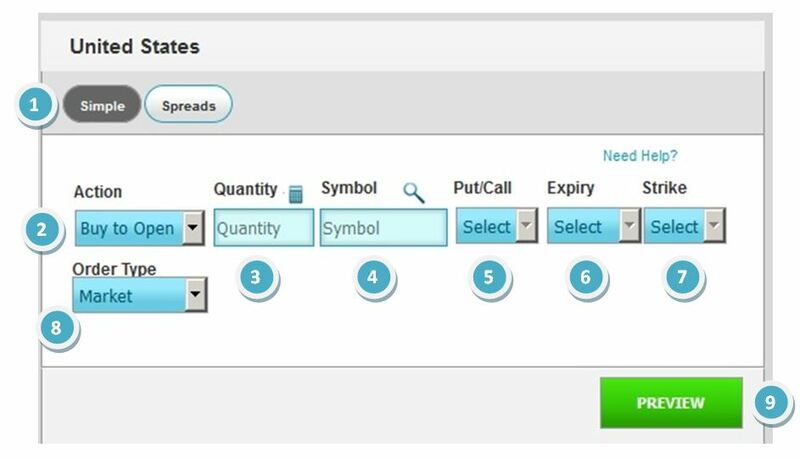 Simple or Spread: Simple is for one option whereas a spread will allow you two options that must both be calls or both puts with different strike prices. Symbol: This is the symbol for the underlying asset. Expiry: This can only be selected after selecting your symbol and put/call. This will select the expiry date of your option. Strike: This can only be selected after selecting the expiry date. This selects the strike price. Order Type: This will select if you wish a market, limit or stop order just as it would with stocks. Select preview and you can confirm your purchase. AAPL1504L85 is the way we write our options and can differ from other websites or brokerages. Our options are written: Symbol Year Day (Call or Put and Month) Strike Price. Hence in the example above AAPL1504L85 : is an AAPL 2015 December Call for $85 strike price. Final Note: It is always a good idea to double check the open interest and volume for options as they trade infrequently. The best and most reliable is directly from Chicago Board Options Exchange (CBOE). 1 of 3) What is an Option? 2 of 3) Which of the following is not a common reason to trade options?